Stunning Bride glam team wedding Hairstyle by Senada K. and Makeup by Biana in New York, NY. Senada K. styled a beautiful bun bridal look. Senada K. Personal Stylist has been working with brides for over 12 years and works with many bridal hairstyles in the NY tri-state area. 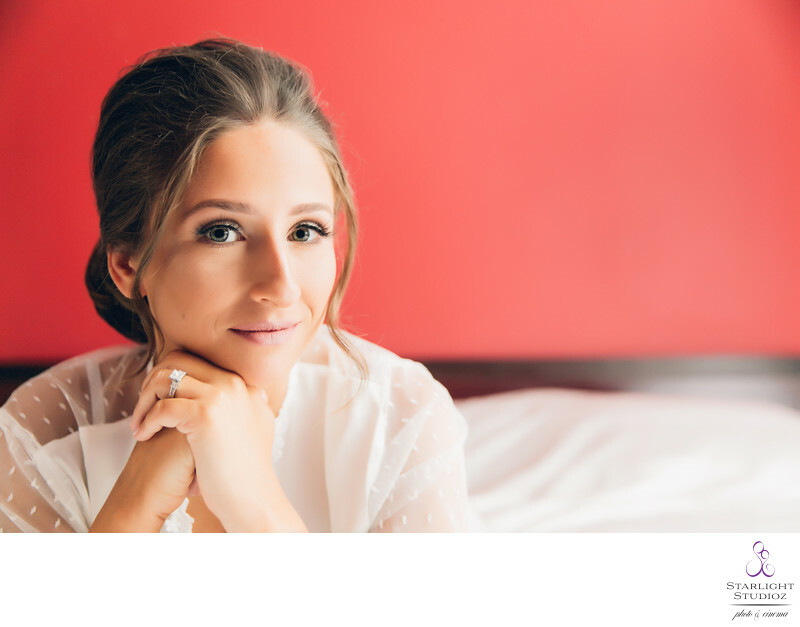 She is a true professional and her gorgeous masterpieces she creates for our ny brides to be are breathtaking with an end result that is stunning wedding photos. Senada is very busy lady often times doing hairstyles for several brides a day. Senada creates the perfect hairstyle to makes you truly feels like a princess for the day. She works with all makeup artists and often teams up with Bridal Styles Boutique to complete the look with their magical high end headpieces. The photos of these beautiful hairstyles including wedding updo's, curls, waves, half up half down, braids, and straight. Add some bling with a bridal headpiece whether it be a crown, hair vine, tiara, and headband. Our bride Tina in the wedding photo has a sleek low bun with a crystal hairpiece around it and some strands of hair around her face to complete the look. Senada created Tina's look in her Brooklyn home and later came to the brides venue at Baku Palace Restaurant after she came back from taking photos at Prospect Park with her fiance and bridal party and right before the ceremony to touch up her hair when she walked down the aisle to say I DO and make sure her NY bridal wedding photos are amazing. The brides makeup was done by Makeup by Biana. Biana is a professional makeup artist in NY & NJ. She is a certified, New York based, freelance makeup artist who eats, sleeps and breathes makeup. as quoted by Biana, Biana she "always seeking perfection, her talent, passion, enthusiasm and work ethic keeps her in demand. She specializes in bridal and wedding parties, airbrush makeup, editorial, special occasions and photo shoots. She believes that makeup is every woman’s boost of confidence." What she created for Tina was utter perfection. Her goal is to make every woman who sits in her chair be the most confident and beautiful woman they can be. Every face is a blank canvas that gives her the power to create something magical. Tina's was a model New York bride and thus making the best NY bridal photos.